Virgin delayed the release of Sparkle In The Rain, which was finished in October 1983, pushing it forward to February 1984 to ensure a simultaneous worldwide release. However, with the Tour Du Monde kicking off with a series of warm up gigs in the UK in November, a single was needed to highlight the tour, and give an indication of what to expect for the album (which was now four months away). 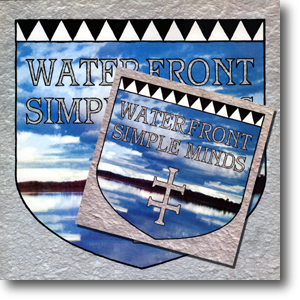 Waterfront was selected as the first single from the album. An excellent choice: it represented of the band’s new sound; was familiar to fans who’d heard its live debut at Crooke Park earlier in the year; and received its radio premiere as a session on Kid Jensen’s show. In addition to two different edits for the single, Lillywhite produced a magnificent extended version, a feat he’d repeat for all the Sparkle singles. A longer edit was used for the commercially available singles - this included a "1-2-3-4" count-in which wasn't included on the album. The shorter edit only appeared on promos. Virgin were customary tight lipped for the lead single of an album, offering a minimum number of formats and tracks. Collectors eagerly lapped up the live version of Hunter And The Hunted, recorded live from the Newcastle City Hall the previous year (and as the gig was recorded for TV and radio broadcasts, was easy choice for B-side material), but there was little else on offer. However, they could take heart by searching out the 7" promo. The matrix grooves across the various formats included the band’s nicknames: MacCracknel (Mick), Pirhana (Charlie), Lasher The Cakeman (Mel) and Dan Yer Man (Derek). A&M promoted the single after the release of the album, pressing up a single 12" promo backed with Up On The Catwalk. Some included promotional pictures of the band. 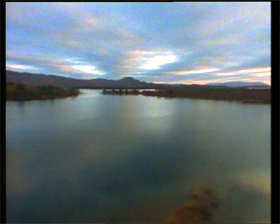 Given Malcolm Garrett's fondness for using videos as inspiration for sleeves, it's interesting noting how similar the picture of a lake used for the sleeve was to the video for Speed Your Love To Me. The videos for Waterfront and Speed Your Love To Me were shot on the 20th November 1983. 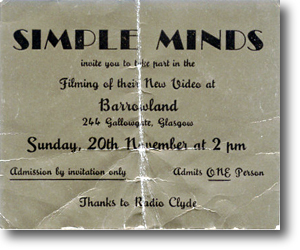 Tickets could be obtained through Radio Clyde. Everyone in the audience also received a badge. The early discographies, which all copied from each other, mentioned a song called If You Want My Love. I've searched through old cuttings, press releases, posters and magazine adverts for a source of this rumour, but drawn a blank. It turns out that the mysterious third track was mentioned in The Music Master trade book (a publication by Music Week magazine) and it's assumed the first discographies got it from there. Meanwhile the band have denied ever recording a song of that name. A limited edition 7" picture disc of the single was released for Record Store Day 2015. This plugged a missing gap in the discography and also tied-in with the reissue of Sparkle In The Rain.